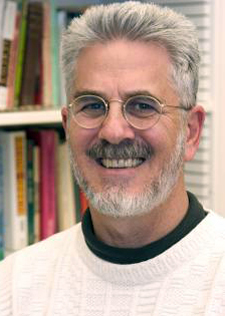 Ronald D. Glass, associate professor of education, is the center's director and principal investigator. The center's interactive web site outlines the societal ills the center hopes to address and describes ways researchers can get involved. A new University of California research initiative, headquartered at UC Santa Cruz, seeks to address the state’s interconnected crises in the economy, education, employment, environment, health, housing, and nutrition. 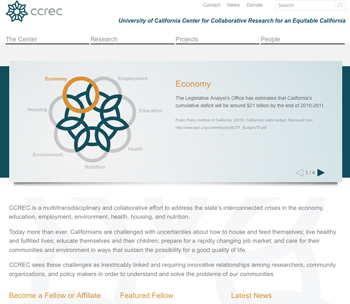 The Center for Collaborative Research for an Equitable California (CCREC) officially launched Monday, February 14 coinciding with the introduction of its interactive web site. UC Santa Cruz education professor Ronald D. Glass, the center's director and principal investigator, said the center’s current priority is a major fundraising campaign to expand the funding base for seed grants and longitudinal studies. Inaugural support comes from a $1.53 million five-year Multi-Campus Research Programs and Initiatives grant from the UC Office of the President. Although headquartered at UCSC, the research group already includes representatives from five other UC campuses, and Glass hopes to engage researchers from the other four as well. The proposal for the research group grew out of two facts, Glass said. First, that California's crises are interconnected. And second, that the university is not currently set up to help communities to investigate those connections and do something about them. The university is organized into disciplinary “silos” and researchers are isolated from the impact of their work, he said. "We plan to work across department lines, as well as across schools and divisions," Glass said. Collaboration is the key and not just within the academic sphere. CCREC seeks to link university researchers, community organizations, and policy makers "so the research can be directly geared into improving our communities," he said. In order to do this, CCREC projects will also seek to engage the public in deliberative processes that grapple with the research findings. "I like to think of it as reimagining both the public and the education in public education, developing learning processes that enable evidence-based decision making by communities" Glass said. "Desperate times call for a transformative vision of the university and its service mission to the state." Glass said the CCREC proposal emerged two years ago as the economy was at the nadir of its sudden decline. He argued that UC needed to be much more involved in helping solve the state's problems. "The university's credibility is at stake," he said. "Now with the budget crisis we have a remarkable opening for profound rethinking of business as usual," he said. And it will require doing more than simply "tinkering around the edges. Whether we will succeed in doing more than just tinkering isn't clear, but if we don't do it now, we probably never will." The research focus will take a "problem-based" approach. For instance, "we know that kids do better in school if they're not hungry, and don't have rotting teeth, or medical problems. We also know that children do better if their parents are educated and have jobs, if families have decent housing,” Glass said. Thus, solutions to the achievement gap in schools lies not just within schools, but within larger sets of issues that undermine the well-being of families and communities. The challenge is how to focus on solutions to the interconnected problems. Glass and his colleagues hope CCREC can help facilitate new approaches to understanding and fixing some of the endemic issues facing the state. CCREC is actively accepting applications for fellows, affiliates, and partners. It is also requesting proposals from faculty for planning and development grants that would support collaborative projects.